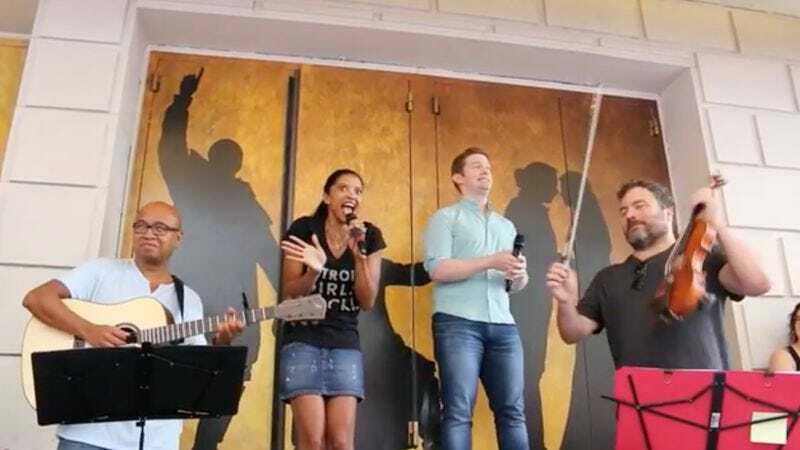 Renée Elise Goldsberry is wrapping up her run as Angelica Schuyler in Hamilton, and she blessed the faithful #Ham4Ham troops earlier this week with a performance of one the character’s cut songs from the show. In the original Public Theater run of Hamilton, there was a song called “Congratulations,” sung by Angelica to Alexander Hamilton after “The Reynolds Pamphlet.” It’s an entire song of Angelica telling Hamilton he’s an idiot, and it’s brilliant, but it was left on the chopping block once the show made the move to Broadway and got tightened up. Parts of the song were folded into “The Reynolds Pamphlet” so that the general sentiment remains, but there’s something delightfully incisive and relentless in Angelica’s words in “Congratulations”: “Congratulations / You have invented a new kind of stupid / A ‘damage you can never undo’ kind of stupid / An ‘open all the cages in the zoo’ kind of stupid / ‘Truly, you didn’t think this through?’ kind of stupid.” As they say in “The Reynolds Pamphlet”: DAYUUUMM. With Rory O’Malley singing for Hamilton, Goldsberry surprised those gathered for the Hamilton lottery earlier this week by performing the lost song with a few members of the show’s orchestra. Goldsberry, who was one of so many Hamilton stars to Tony Award this year, prefaces the performance by saying she has never done it before, but she kills it. “Congratulations” goes deeper into Angelica’s feelings about her sister Eliza, her loveless marriage, and her longing for Alexander than her short but spectacular verse in “The Reynolds Pamphlet” does. Goldsberry encouraged the audience to sing along to the familiar parts. The August 31 performance marked “one last time” for the regularly scheduled live #Ham4Ham, which first launched in July 2015, and the final in-person lottery. The Hamilton lottery will only exist online from now on.